With nearly 20 years of experience and more than 32,000 hours logged, Kenny Wilson is truly a Tradesmen International rock star. 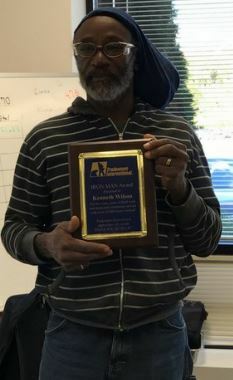 That’s just part of the reason we’ve recognized Kenny, a carpenter from our Maryland office, with our Iron Man Award. Who inspired you to become a craftsman? My inspiration came from my grandfather, who was a carpenter. What do you love most about your job? I love working with my hands, building things and seeing my work. I love having people admire my work and being able to meet different people. What is your favorite thing about working for Tradesmen? It’s always a new adventure. Every new job brings challenges and you never do the same thing. What has made you want to stay at Tradesmen for nearly 20 years? Meeting many different people, working with different contractors and getting to know them. Do you have any memorable stories or experiences from your time at Tradesmen? I enjoyed working with SBER. They’re always working on old buildings and renovating them into cool places. I also enjoyed working with Azola on the Ivy Hotel, a small hotel with so much architectural woodwork. I could believe the rooms were going for $1,500–$4,000 a night. What advice do you have for others considering a career in carpentry? Being a carpenter is very rewarding, building something with your hands and having other people admire your work. Please join us in saying thank you to Kenny for his passion and commitment to his craft!